A few years ago, a top researcher at the National Institutes of Health appeared in the news and stated that taking vitamins has no effect on disease. 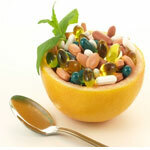 I thought it was a curious statement considering that a number of diseases were known to be preventable by vitamins. And recently, the evidence is even stronger. Over the past 18 months, there has been an explosion of research on vitamins and their ability to prevent or reduce the risk of a number of serious diseases. Researchers have discovered that multivitamins significantly can reduce the risk of developing Alzheimer's disease and that vitamin E reduces the risk of prostate cancer. In addition, there is increasing evidence that vitamin D plays a significant role in preventing or treating multiple sclerosis, osteoporosis, some cancers and chronic pain. Consider just one of those disorders: multiple sclerosis, or MS. No one really knows what causes MS, but researchers believe it results from the body attacking its own brain and spinal tissues. MS occurs much more frequently in the Northern latitudes. People in sunny climates closer to the equator have a low incidence of MS.
Is it possible that decreased sun exposure increases the risk of MS? If this is true, what is it about sun exposure that helps to protect against MS? The most obvious answer is vitamin D.
There are a number of different forms of vitamin D. The most active form of vitamin D is created by exposure to the sun. Therefore, people who have increased sun exposure and proper diet probably have the highest levels of the active form of vitamin D.
Here in Chicago, we have moderate amounts of sunshine but some factors might limit exposure, such as coats and hats in cool weather and high-SPF sunscreen on sunny days. Both result in decreased exposure to sun and possibly in decreased production of the active form of vitamin D.
What are the options? We could all spend two or three months a year in Cancun...not likely. Another option is to make sure we are getting adequate amounts of vitamin D in our diet. The recommended daily amount of vitamin D is about 400 international units per day, but for most people living in the northern latitudes, higher doses might be necessary. Too much vitamin D can lead to serious side effects such as headaches, weight loss, kidney stones, deafness, blindness, diarrhea and even death. Dietary sources of vitamin D include multivitamins, other dietary supplements, cod liver oil and vitamin D-fortified foods. One of the benefits of nontraditional medicine is that it has promoted research in treatments other than pharmaceuticals. Many of the results have been fascinating and will change how we view disease and its prevention. About the Author: Patrick B. Massey M.D. Ph.D. is Medical Director for Alternative & Complementary Medicine, Alexian Brothers Hospital Network. Website: www.ALT-MED.org.